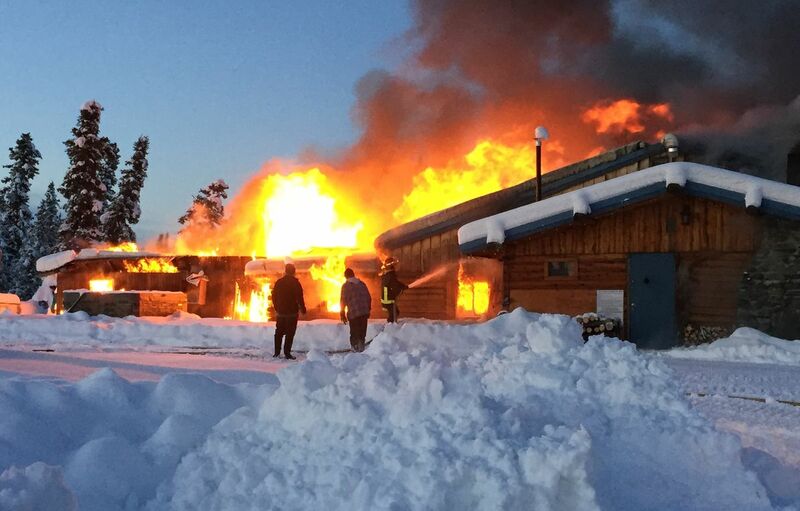 Mendeltna Creek Lodge, a roadhouse west of Glennallen that is more than 80 years old, was destroyed in a fire on Sunday, according to its owner, Mabel Wimmer. Her two English mastiffs, Farquar and Rionock, and her hairless cat, Elsie, perished in the blaze, she said. "My house is historic and it's beautiful. … It's just a huge part of Alaska," she said. "But my animals being gone is just devastating. They were my friends. They were my best friends." Wimmer was in Palmer singing with a community chorus when she got the news from a neighbor at the scene near Mile 153 of the Glenn Highway, she said. "He said, 'Mabel, I'm so sorry, the house is on fire,' " she said. "It took not any time at all for the house to burn down." Kelly Allain, a neighbor, said she got a call about the blaze at about 9 a.m.
"My husband and I jumped out of bed and we got on the scene around 9:15," she said. "It was going. It was blazing." Volunteer firefighters extinguished the blaze, Wimmer said. The rental cabins around the lodge were undamaged. She didn't know the cause of the fire.